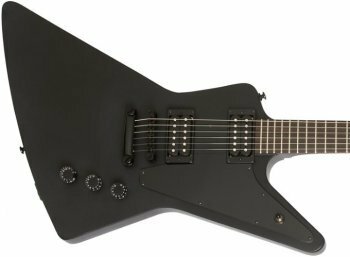 The Explorer is an electric guitar shape that, like the similarly retro-futuristic Flying V model, has been replicated and modernised by manufacturers such as ESP, Dean, Jackson, BC Rich and Hamer. Its roots lie as a 1950's Gibson innovation, which is why the Explorer name rests firmly with them. The shape, however, has been more closely associated with heavy metal in modern times. This page will bring together the best Explorer guitars and copies available to guitarists on a budget of less than $400. Whether you want to retain the vintage tones of the Gibson original, or you want something a bit hotter for metal, this top 3 will help you find the right one. Defining Features Good all rounder. V-shaped headstock improves ease of play. Made for metal. Extra jumbo frets and thin neck for fast lead. More traditional Explorer spec. All mahogany and set-in neck for maximum sustain. Nut Width 1.69" 1.65" 1.68"
The Dean Z has been around since the 70's, popularised by several high profile players, and has stood the test of time due to its unmatched playability and unique, radical Explorer style cut. Today's Z X offers guitarists on a budget the same great design with some careful cost cutting. One of the more embellished Explorer copies with the legendary Dean V-shaped headstock. The design is such that it maximises string length and this supposedly contributes to its exceptional ease of play, even with high actions. With very hot and loud pickups, the Z X will confidently take on most styles of metal but many users have also ventured into classic rock, blues and even jazz with this tamable beast. It's more versatile than it looks. Certainly the most versatile of the axes featured on this page. Needless to say it handles volume and distortion well and doesn't need much in the way of fancy pedals and tone enhancements to deliver a solid metal tone. The neck pickup adds a bit of low end warmth to the mix, whereas the bridge is razor sharp and on the brighter side with decent clarity and note articulation. The middle position, therefore, unlocks a powerful combination. Users warn prospective buyers to get proper locking strap buttons to hoist up this fairly large and heavy axe. It's therefore perhaps not ideal for the slender framed or short player. ESP's EX range has become known as the definitive "Explorer for metal". Down at the budget end of the range is the very capable LTD EX-50. Even at less than $300 it can satisfy most metal appetites. An altogether spikier reincarnation of the classic Explorer shape and built to handle more modern, extreme metal styles. It's no surprise therefore that the majority of users have bought it for exactly that purpose, and it hasn't disappointed. The basswood body (some models are agathis) may not seem the ideal tone wood for a metal guitar, but the sheer size of the body counteracts this potential weakness, alive with squealing harmonics, growling drop power chords and clear, rich cleans. Distortion is crisp and razor sharp, not fizzy and weak like many cheap metal guitars. Basswood also has the benefit of being lighter than the more typical, denser mahogany body. The stock ESP bridge pickup may not pack the punch of an EMG 81 but, unlike a lot of cheap guitars, it doesn't restrain its raw power... and it's hotter than the sun. You may, however, find the neck pickup rather redundant in comparison. If you make a direct comparison, you'll also notice the EX-50 lacks the beefy bottom end of the all-mahogany Epiphone '58, partly due to the basswood body and maple neck, but a decent amp will help to balance things out. The Extra Jumbo frets are supposed to be a cheaper alternative to a scalloped neck, allowing for less obstructed bends and vibratos (as the fretted string is raised more off the actual board, meaning your finger doesn't rub against the wood as you bend). This, along with the fast, "thin U" neck, will prove a welcome feature for any lead players and especially shredders. Like the Dean, it's on the heavy side, so be warned you'll need some muscle power to stand with it for prolonged periods. For those who want a more authentic, vintage Gibson specification with some choice modernisations. Built for overdrive, Epiphone's 1958 "Goth" Explorer delivers huge, balanced rock tones and long lasting sustain. Semi-faithful to the original '58 Explorer, with one difference being the modern, slim taper neck. However, many players today are used to the slimmer, faster profile necks so this seems a sensible modification. Users generally consider the Explorer to possess a natural, well balanced tone. It has that chunky Gibson warmth and depth (due to the huge slab of mahogany) but with brighter overtones than its Les Paul cousin. The mahogany body and set-in mahogany neck is what truly sets the '58 apart from the other two picks in terms of stock quality. An overall fatter, fuller and more resonant output. However, it still manages to come in the lightest of the three - something to keep in mind. Criticisms tend to focus around the lack of clarity in the stock pickups, if not their general output volume (this is a loud axe). It's one of those guitars you'll seriously want to consider a pickup change somewhere down the line to clear any muddiness and truly do it justice. Throw in some BurstBuckers to resonate its latent vintage 50's vibe or some EMG 81's or 85's to heat things up for a more modern edge. Not necessarily a limitation, but more a specialisation, the stock '58 is firmly in rock and classic metal territory, with enough sustain to handle those wailing vibratos and enough punch for those meaty power chords. However, some owners have also managed to coax some sweet jazz tones from the neck position, with plenty of bass to underpin those chord vamps.